Ok, I have to admit that I wasn't too sure how onions would taste with cod. Well, now I know - fabulous! 2. Combine tomatoes, onions, orange zest, oil and chopped thyme in a 3-quart glass or ceramic baking dish. Sprinkle with 1/4 tsp salt and pepper; stir to combine. 3. Roast, stirring occasionally, until the onions are golden and brown on the edges, about 45 minutes. Remove from the oven. Increase oven temperature to 450ºF. 4. Push the vegetables aside, add fish and season with the remaining 1/4 tsp salt and pepper; spoon the vegetables over the fish. 5. Return the baking dish to the oven and bake until the fish is opaque in the center, about 10 to 12 minutes. 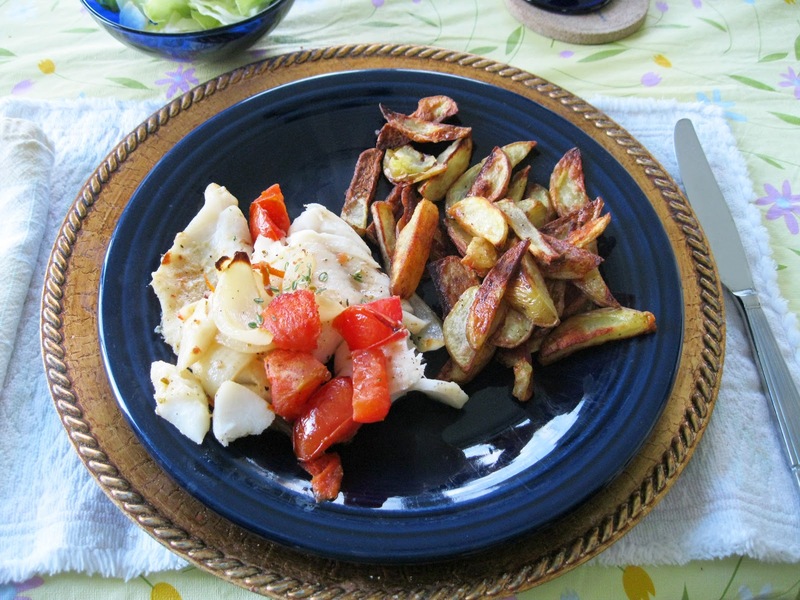 To serve, divide the fish and vegetables among 4 plates and garnish with thyme sprigs. The only thing I would do differently is add the tomatoes at the same time adding the fish. This way the tomatoes are more al dente than stewed. Welcome to Healthy You - Join us in taking control of Diabetes one tasty meal/dessert at a time. The results are in - lab results confirm following these healthy recipes works! Whether you are newly diagnosed or a seasoned Type 2 Diabetic, welcome. For me it'll be five years since being diagnosed, and I don't mind saying maintaining a diabetic-friendly diet 24/7 "just ain't no walk in the park" to put it bluntly. Example - I was out in California at Disneyland shortly after being diagnosed. My friends and I were hungry so we headed over to Downtown Disney. As we were about to choose a restaurant, my dear friend, Jonathan, turned to me and asked "So what can you eat?" My response, "Food." Yes, everyone had a rather good laugh. And you should too. It is true, you do have to be more aware of what you eat. But, diabetes management has come a LONG way from even 15 years ago. Now, you can have a small amount of REAL sugar, as long as you factor it in with the rest of your meal's total carbs. So the reason for this blog? My close friend, Teena, knows that I've been recently trying different diabetes recipes. When I invited her to join us for dinner, she asked "Why don't you do a blog and share these recipes? Give the REAL scoop on whether to bother, changes required or if it's a keeper." I had already been posting a short snip-it and pic of the dish/dessert on Facebook with positive input from friends. So, this just seemed to be the next logical step. So with that, here's to eating not only food, but REAL guilt-free comfort foods (yes you really can use the words "guilt-free" and "comfort foods" together) and desserts (honestly). Ready?